Florida 528 (Beachline Expressway) at Tradeport Drive south and Conway Road north by Orlando International Airport (MCO). Photo taken 07/09/16. 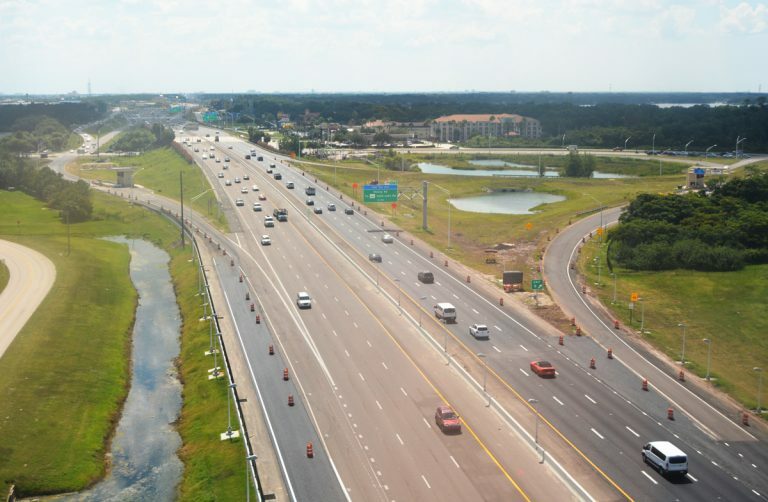 The Bee Line Expressway, named because it "beelined" east to Interstate 95, opened initially in 1967 from Sand Lake Road east to Orlando International Airport (MCO) and SR 520 near Bithlo. Sand Lake Road (SR 482) provided the link west to I-4 until December 1973, when SR 528 was built to the south. Extension of SR 528 east into Brevard County includes two prongs: The southern prong represents the SR 528 mainline to Interstate 95 and Bennett Causeway to Cocoa Beach; The northern prong, designated SR 407, stems northeast to I-95 and SR 405 (Columbia Boulevard) at Titusville. SR 528 east to Port Canaveral and SR A1A is a toll free route. 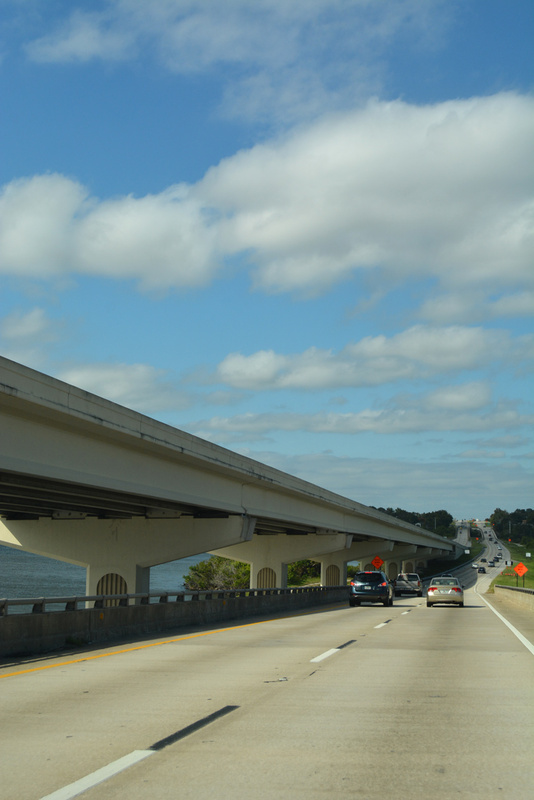 SR A1A north & 528 west span the Indian River across Bennett Causeway in Brevard County. Photo taken 10/21/18. Bennett Causeway will be reconstructed and expanded from Industry Road (SR 524) to a point east of SR 3. Estimated to cost $259 million, Project 407402-3 widens SR A1A/528 to six overall lanes, with an express lane in each direction, and replaces all bridges except for the 2006-built eastbound span over Indian River. A multi use trail will be added along the north side of SR 528 and the interchange at U.S. 1 will be rebuilt. Project 407402-4 further widens SR 528 east from SR 3 to SR 401 at Port Canaveral. Anticipated to cost $216 million, the 5.091 mile project includes replacing all bridges, improvements at interchanges with Banana River Drive, SR 401 and George King Boulevard, and extending the multi use trail east from Merritt Island. Work scheduled to start in 2027 includes upgrading the diamond interchange with SR 3 (Courtenay Parkway) into a SPUI. International Drive north at the folded diamond interchange with Florida 528 (Beachline Expressway). Photos taken 11/14/15. A Breezewood connection links SR 528 (Beachline Expressway) east with Florida's Turnpike via Consulate Drive and Orange Blossom Trail. Trailblazers for the turnpike direct motorists south from Exit 4 to U.S. 17-92-441 north. Photos taken 02/27/16. Trailblazers direct motorists from U.S. 17-92-441 (Orange Blossom Trail) along Consulate Drive northwest to the half diamond interchange with the Beachline Expressway. Photos taken 08/10/13. The southbound off-ramp from Florida's Turnpike ties into Consulate Drive across from the westbound on-ramp to SR 528. Southridge Commerce Park lies just to the west. Photo taken 08/10/13. "S.R. 528, turnpike get toll-within-toll - Work on BeachLine Expressway likely done in 2019." Orlando Sentinel, The (FL), June 11, 2016.